It's no secret that there is a growing demand for more powerful outboard motors. These new outboard motors have fueled a demand for larger boat designs that previously may have been powered by stern drive or other inboard power. As more powerful outboards are introduced, the boats get bigger and as the boats get bigger, outboards are getting more muscular. Suzuki has embarked on a major engineering expedition to build the Ultimate 4-Stoke Outboard Motor. In developing the new DF350A, Suzuki Engineers started with a clean sheet of paper and considered many factors for this design. Making more horsepower can be accomplished in many ways. The engine design can include larger displacement and adding turbo chargers or superchargers. However, larger displacement engines typically burn more fuel and increase the overall weight. While adding complex mechanical components can create reliability concerns. Once you have all of that horsepower, now the challenge is getting it to hook up or grab traction in the water. 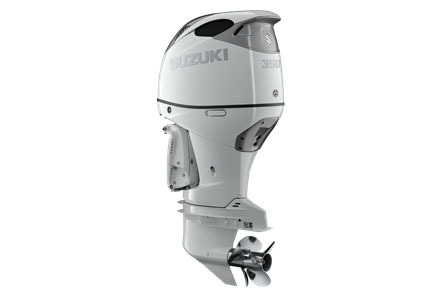 Suzuki Engineers labored through years of trial and success with computer simulations and on water testing to significantly improve the way an outboard motor converts engine power to underwater thrust. Join us as Suzuki introduces the next milestone in our history.....The 350 horsepower DF350A....Suzuki's Ultimate 4-Stroke Outboard Motor.